Q: Why do I need so many different vitamins and minerals? A: Our food supply may be lacking in essential nutrients since our environment is flooded with pollutants, and modern stressors confront us at every turn. That’s why all the ingredients in our formula have been carefully selected to provide you with a comprehensive package of antioxidants, phytonutrients, and energy co-factors to help support any gaps. Q: What are the trace minerals in the "Trace Mineral Complex"? A: This ingredient contains chloride, magnesium, sulfate, sodium, potassium, lithium and boron. A: Damage Control is a “fractal” formula; you can take as much or as little as you need on any given day, depending simply on how you feel. There is no right or wrong dosage since each capsule contains a proportion of everything on the label. A: Maintains optimum potency for up to 18 months. Please store in a cool, dry place and avoid direct sunlight. Q: My capsule seems to be a darker color than usual, and there are dark specks in the capsules, are these okay? A: There is nothing to worry about. It is literally reacting to the moisture in the gelatin capsule. With that, it doesn't do any harm to the powder. The worst that can happen is the potency decreases a little. Rest assured there are lots of checks and balances when making our supplements. Obviously, we want to hit 100% potency, so we do a plus 10% on the ingredients in every batch so that it will also allow for any possible deviations. Q: How is Primal Damage Control different from Primal Master Formula? A: Primal Damage Control is a budget-minded alternative to Primal Master Formula. It uses the same manufacturing technologies and the same sources of ingredients as the Master Formula, but omits and/or reduces some of the most expensive ingredients. 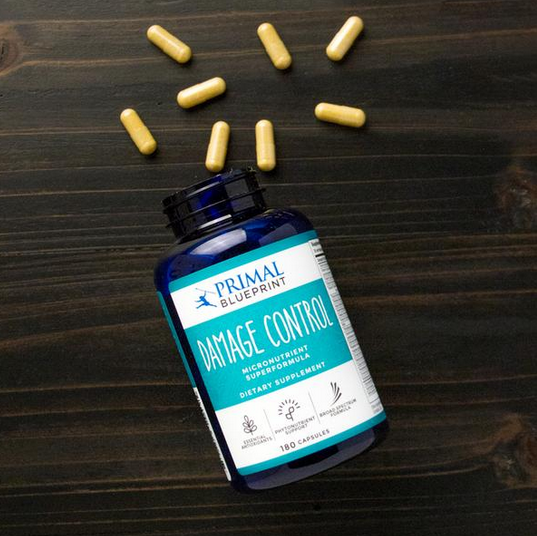 The Damage Control formula has a lot more CoQ10, more phosphoseryl and more of those really key expensive nutrients. There are things in here that are not in the Master Formula. With this formula, you can take as few or as many as you want to be based on how you feel. It is less potent and is recommended for people with sensitive stomachs. Q: Is there any glyphosate in your gelatin capsules? A: The Supplier confirms minimal residue and compliance with European Union regulations - the capsules adhere to strict European Union regulations for quality and pesticide residues. EU regulations are higher (more strict) than in the US.